Nov. 3, 2017 4:00 p.m. Hundreds of students and community members gathered for the Don Campbell Elementary School official grand opening Friday. 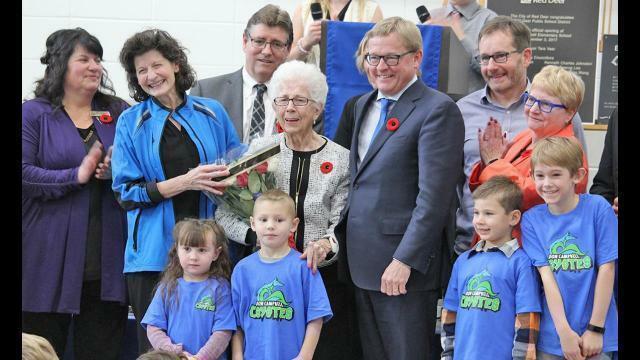 Named after a great leader in education, Don Campbell, his family and friends were honoured to celebrate the occasion. “I’m just so proud of this staff and these kids and this community and how they are celebrating someone who I think is a great man,” said Jan Ludwig, Don’s eldest daughter and Grade 2 teacher at the school. She added that she carries him always, and having a school named after him is humbling. The school houses almost 400 students, and is not just for the students, but the whole community. “The whole city can celebrate to have such a wonderful new building. It’s something that can be used during the day and in the evening. It’s truly a remarkable day, I wouldn’t miss it for the world,” said David Eggen, minister of education. He said 53 new schools have opened this fall in the province, with another contingent coming again in January. “It’s part of the largest, not just school build in the history of the province, but the largest infrastructure build too,” said Eggen. “We’re a very young population here, youngest in the country and people are staying, they’re moving and they’re putting down roots, so for the long term this looks very hopeful and optimistic. Red Deer’s a perfect example of the vitality of Alberta in 2017,” he added. Mayor Tara Veer said the City of Red Deer partnered with Red Deer Public Schools to have community space, which is essentially the community centre for the area neighbourhoods. And Veer said schools are highly important for a couple of reasons. The capital cost of the school was over $13 million, and offers a wide range of features for students and the community. “We’ve got a community room, community washrooms, community gymnasium, so that we can really maximize the use of this building,” said Stu Henry, superintendent for Red Deer Public Schools. Other features include a fine arts room, music room in the middle hub of the school, a wide open learning space acting as the learning hub for the school and garage doors between classrooms allowing for more flexibility. “Lastly we have outdoor classrooms, so almost all the classrooms have their own little courtyard where we can spill out and have the learning happen outside as well,” said Henry. Don Campbell’s wife Millie was very emotional, and said today was like a dream. “It’s lovely with the support of all my family and friends, how lucky can I be. It’s wonderful,” she said. She added that if Don were here, he would have been right in the middle of it all.